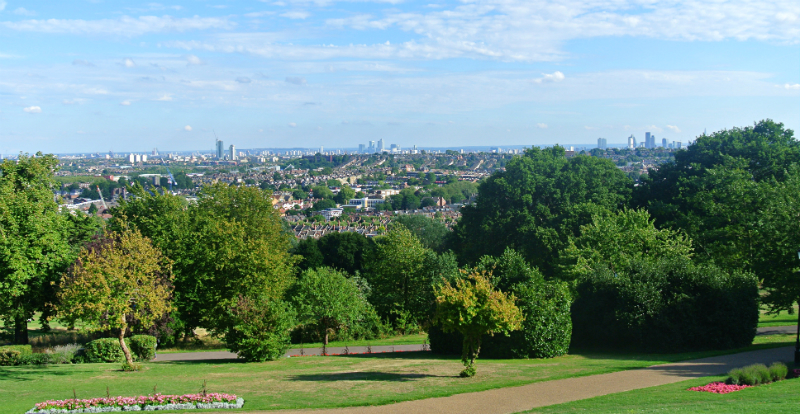 I love relaxing in London’s parks and I recently spent quite a bit of time in my local park that also has one of the best views over London: Alexandra Park – also known for Alexandra Palace aka Ally Pally. Whenever I get time, I head to the park to chill in the sun and enjoy the views. 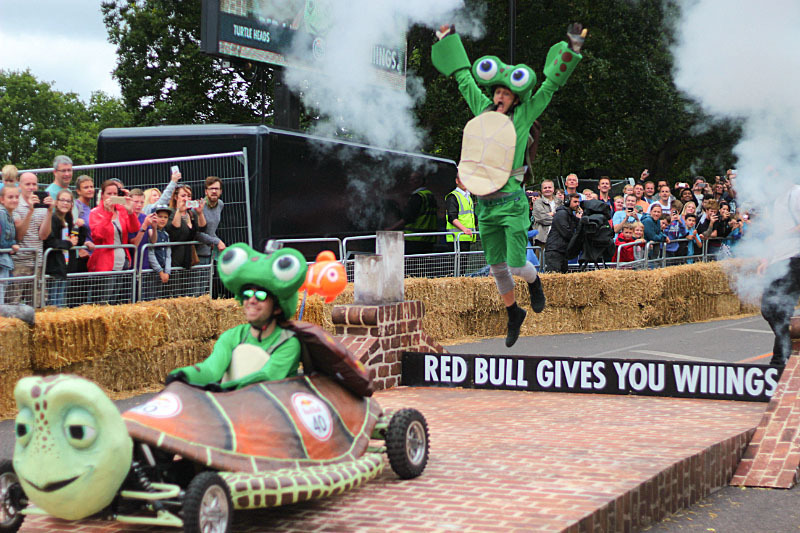 But in the past months, they’ve also hosted quite a few events such as the Red Bull Soapbox Race and a Food & Craft Beer Festival, so I had even more reasons to go. The 80 hectare park is located in North London between Wood Green and Muswell Hill and was declared a Local Nature Reserve in 2013. 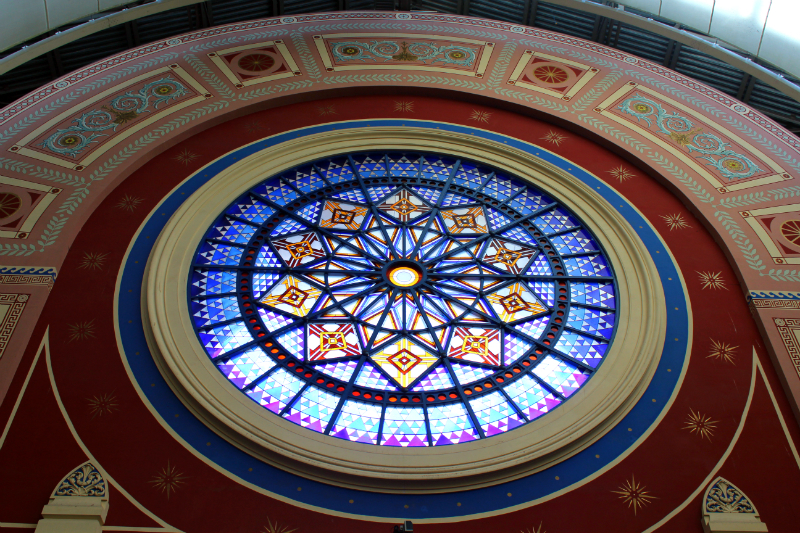 It can either be reached by train via Alexandra Park station or Muswell Hill and Wood Green via the Northern and Piccadilly Line. 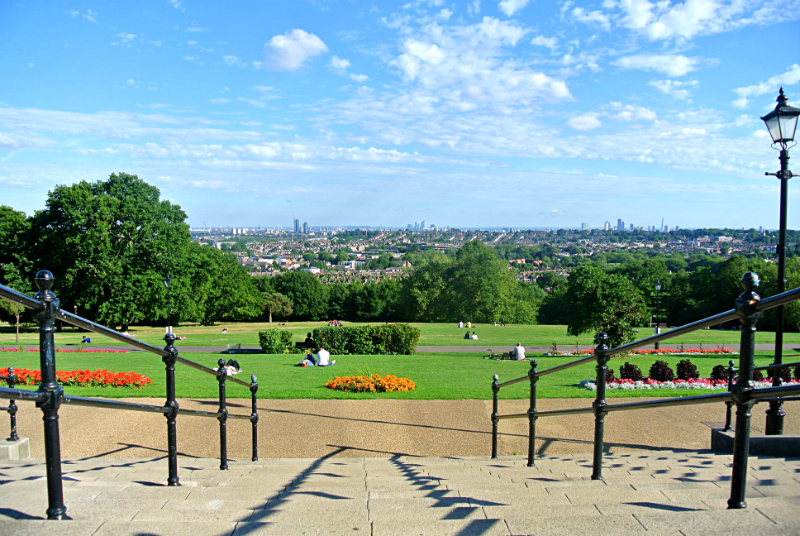 I always enter the park from Muswell Hill which brings you straight to the top of the park and Alexandra Palace. 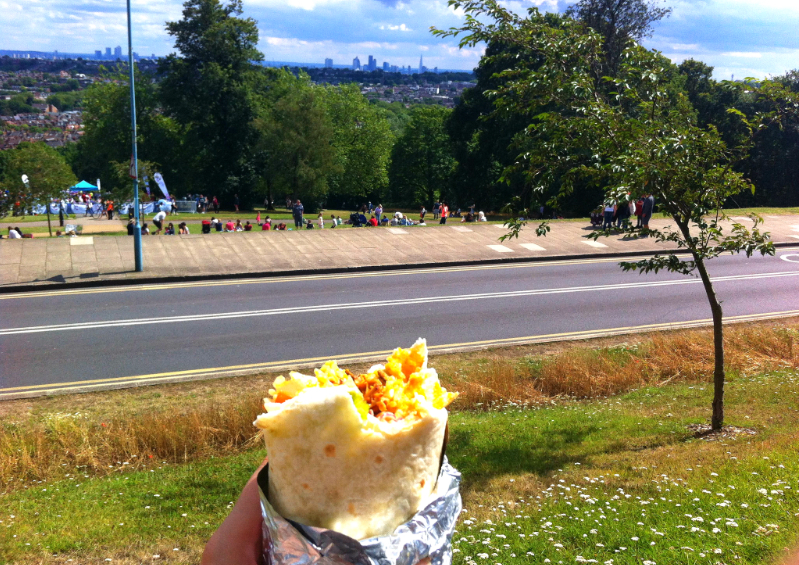 The view over London is one of my favourites and the leafy park always looks extremely well-kept. You can see the city of London, the Olympic Park and even Greenwich on a clear day. Doesn’t this look beautiful? 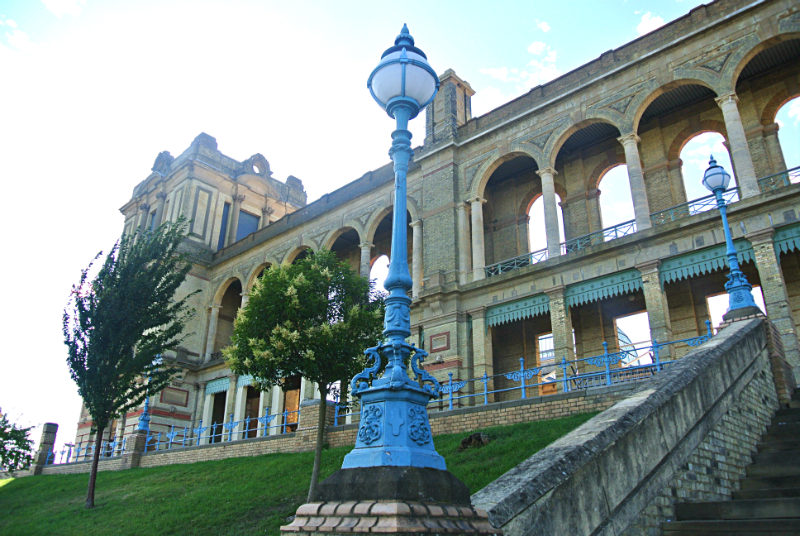 The park is dominated by the famous Alexandra Palace – some parts of the building look a bit run down and do need some restoration but this all has a reason. In 1980, a fire broke out during the Capital Radio’s Jazz Festival and destroyed most of the building. Just the eastern parts including the theatre and BBC television studios could be saved – due to a lack of money not everything could be refurbished immediately. 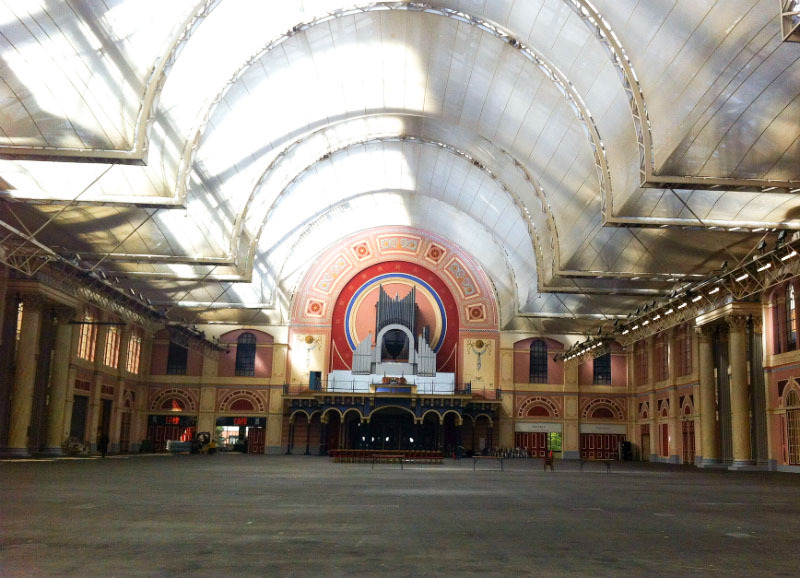 One of the areas that remains to be open for the public is the Great Hall. It’s a huge open space that is used for exhibitions, conferences and music concerts. I’ve only been in there for one event – the German Beer Festival – and it was like one big party with music acts, happy people and lots of food and beer. Recently, some great music acts have also been rocking the stage like Florence & the Machine followed by Rudimental in October (unfortunately I missed getting a ticket 🙁 ). The palace also hosts a pub, ice ring and palm court. 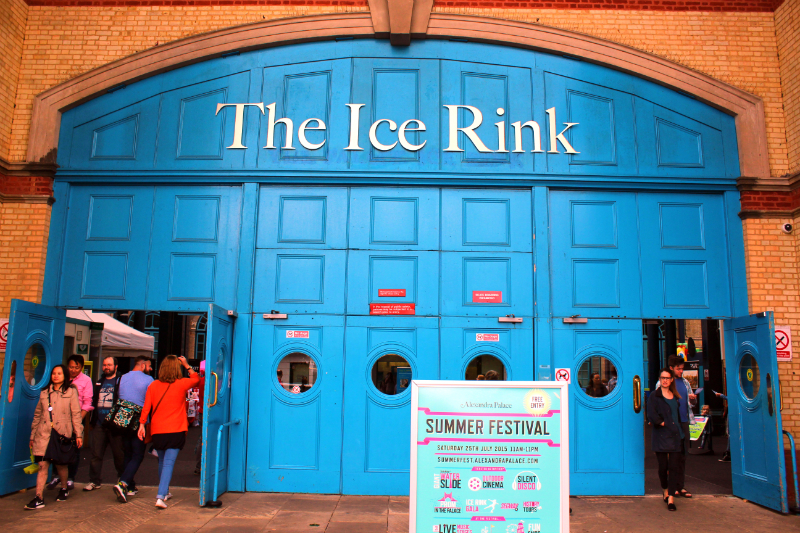 I love ice-skating, but have never been to the ice-rink – this will definitely change this winter. 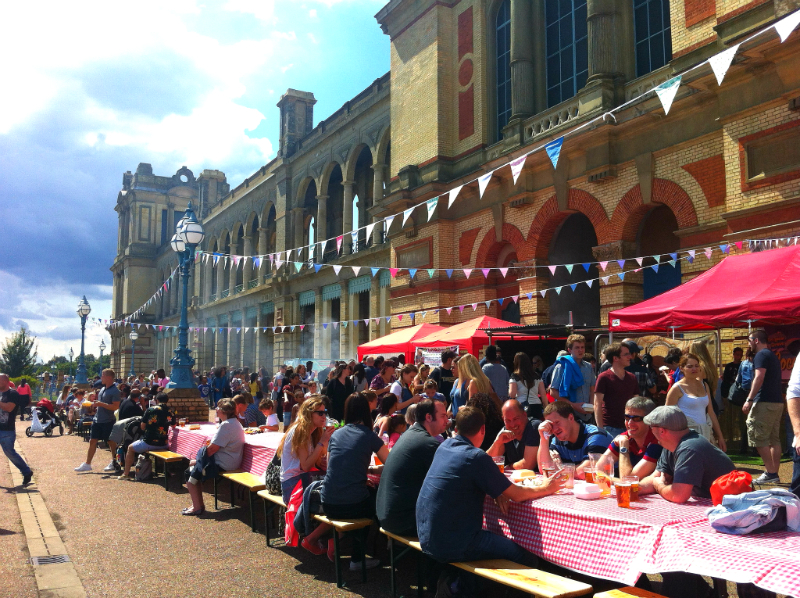 During the summer months, lots of foody events took place including the Foodies Festival and the Street Food & Craft Beer Festival. I’ve went twice this summer and although the selection of food stalls was limited compared to other markets, the variety was great and I couldn’t resist trying some delicious Mexican and Greek food. Every Sunday, there’s also a Farmers Market at the bottom of the park that offers lots of nice treats and fresh food. 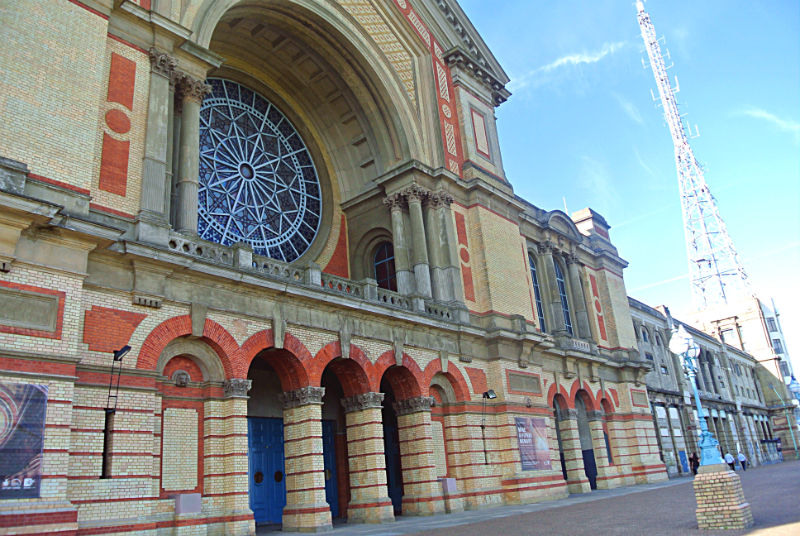 Alexandra Palace is also known for sport events and especially the PDC World Darts Championship that takes place around Christmas. Tickets are literally gone within hours, so it’s quite a big thing. 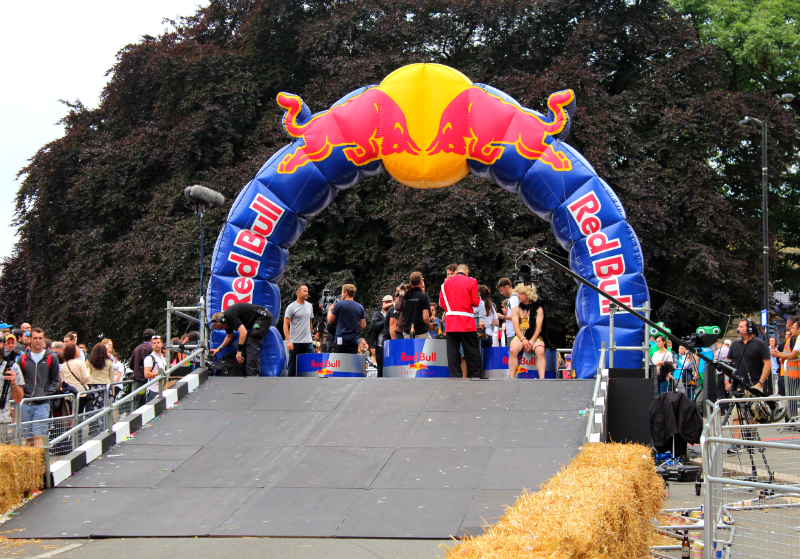 Another event I was really looking forward to this summer was the Redbull Soapbox Race in July. It proved to be such a fun day watching all the different carts racing down the hill with some of them crashing or falling apart half way through. Another cool event I enjoyed was the Summer Festival at the end of July. Besides the usual food stalls, there was so much to do including dancing to the tunes at the silent disco, a historic walking tour through the palace, sliding down the hill of Alexandra Park and watching Dirty Dancing at the Open air cinema in the evening. 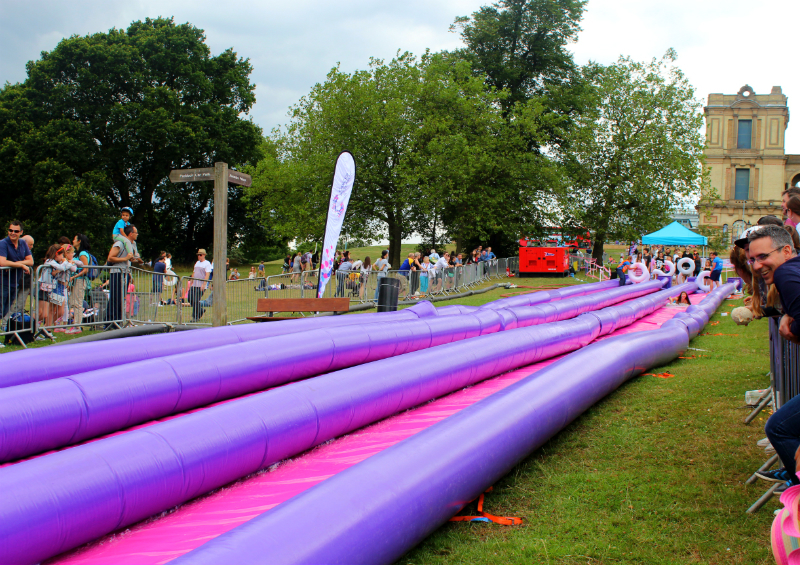 I was very tempted to give the water slide a try but wasn’t dressed quite right. But watching people coming down the hill, was so much fun too. 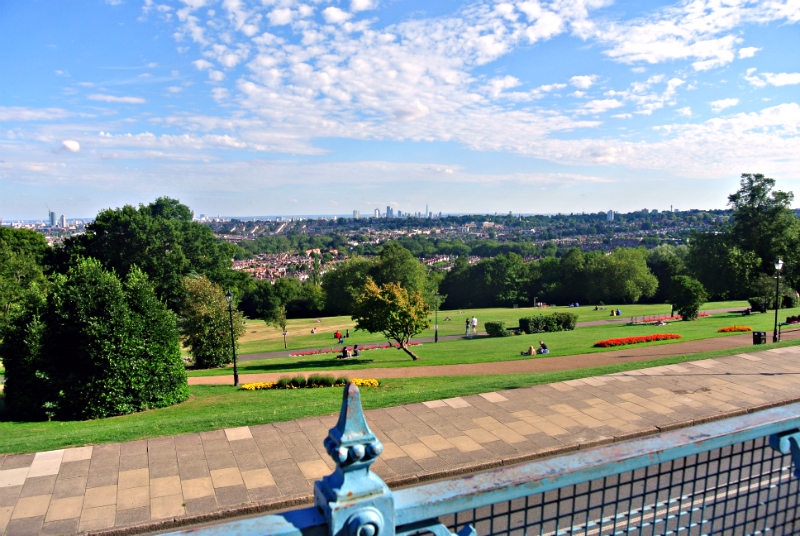 I enjoyed spending a lot of time at Alexandra Park this summer and I’m sure that I’ll be back even it’s just for the views over London. 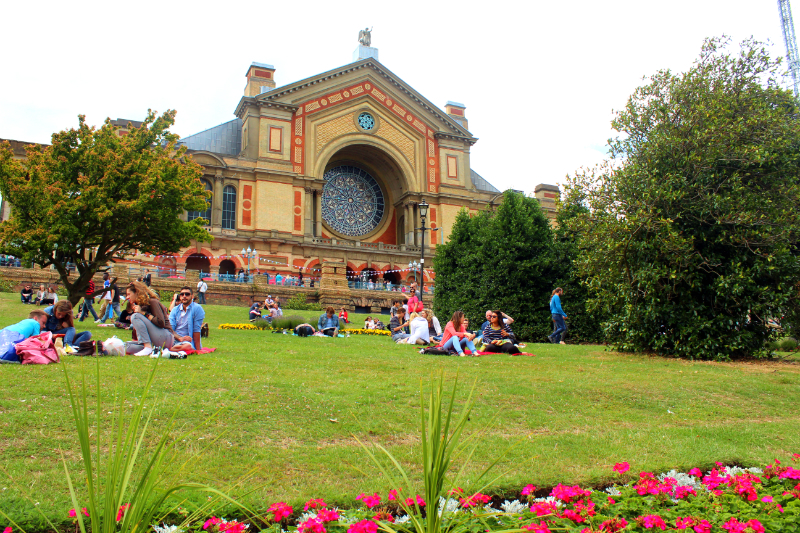 Have you been to Alexandra Palace and Park? What is your favourite park in London?